Search Results for "desk job"
A young businesswoman quits her job by leaving a note on her desk and leaving her workplace. Closeup footage. Concentrated male job applicant completing employment application form at office while pretty hr recruiter working at her desk. Serious job seeker filling out application form for new vacancy. Sleepy tired female employee taking a nap at office desk, covering head with documents during business hours. Lazy unproductive worker sleeping at workplace and leaning on office desk, avoiding job. Motivated male job seeker in formalwear talking with office manager at the desk before job interview. Positive attractive female secretary welcoming job applicant at corporate office. 1950s: Man in suit talks while seated at desk, pulls papers from drawer and places them on desk. Hand sorts through job pamphlets. Man talks to camera, grabs note cards. Tilt-down shot of pretty young business woman working on computer late at night typing using keyboard sitting at desk alone. Overtime job and career concept. Handsome Businessman Works on a Laptop at His Desk, He Finished Job, Broke the Jackpot, Won Big and Is Happy and Celebrates His Success. Stylish Man in Modern Glass Office. Shot on RED EPIC-W 8K Helium Cinema Camera. Archive Company Businessman Sleeping Tired on Office Desk Late After Job Program. Boy sitting at school Desk and does the job. School education. The sun's rays through the glass. The student is sitting at a Desk and does its job. School education. The sun's rays through the glass. 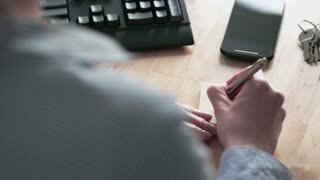 Businessman writing resignation notice letter, leaving job, work desk close up. Boy sitting at school Desk and does the job. School education. Reading of books. UNITED STATES: 1940s: Lady notices that a piece of her typewriter is broken. 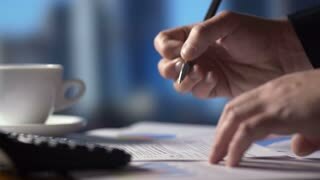 Man sits at desk and sorts through papers. Man at desk opens a letter. Letter applying for a job, that has no punctuation in it. Cute girl company manager is talking on mobile phone and using laptop sitting at desk in dark office and smiling enjoying her job and holding to-go coffee.